I've had a number of friends, neighbors and online readers get in touch with problems with their grilled hamburgers. One of the most common problems noted was that the hamburgers fall apart on the grill. Other things mentioned were barbecue burgers sticking to the grill grates, burgers puckering up like meatballs, burned burgers, undercooked burgers, and burgers lacking flavor. Hamburgers rank right at the top of the list of things folks like to cook outside on the grill, so it's really a shame when things don't go right. No one likes to work hard on a barbecue meal and be sitting there anticipating a delicious grilled burger meal and then have a flop. One tip I'd give is to buy a good grill. If you're using a low end grill, it's going to be hard to cook anything - including burgers. It can be done. Burgers can be done right, but it really takes some skill to work with bad grill equipment. 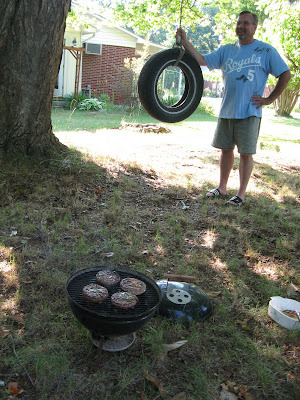 As far as those other little (or big) hamburger grill problems, I wrote up a trouble shooting guide for grilled burgers. I covered all the issues folks had mentioned plus some others that I thought might come up. I'll add to the guide as needed, so if you have a flop with your grilled burgers and don't find the answer in my barbecue burger guide, just let me know. I'll go in and add your problem and offer a solution.